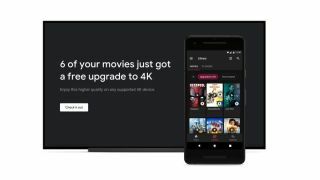 If you’ve ever purchased a movie or TV show in SD or HD from the Google Play Movies & TV Store, Google is going to upgrade it to 4K free of charge. Probably. The caveat is that you need to have purchased the film in one of the aforementioned lower resolutions (either HD or SD) and, more importantly, there needs to be an equivalent 4K version on the Google Play Store. The upgrade offer is also only available to folks living in the US and Canada with no firm announcement on when this upgrade could come to other territories. That said, if you live in one of those two countries, and Google can find an equivalent match, the higher-resolution file will be all yours to stream to your heart’s content. To coincide with the announcement, Google will also be giving an update to its Play Movies & TV app on Samsung TVs that will enable 4K streaming and will enable HDR playback on 4K Sony TVs, too. On top of all that, all Play Movies & TV apps on LG, Samsung and Sony TVs will be updated with a new UI this week as well. According to information from Google, 4K content will begin rolling out today with movies and TV shows from participating studios, with more content and additional upgrades in the future as more 4K content becomes available.